When you’re on vacation there always seems to be at least 3 options of one type of food. During decision making time you want to make sure you make the best choice of the three; but how do you know? During my most recent trip, my cousin and I decided to try the most recommended and centrally located Cabo pizza locations. Cara’s from New York and swears that after a night out, nothing is better than Pizza. Would it hold true in Cabo? We decided to find out. Our mission if we chose to accept (and of course we did) was to try the following Cabo pizza places: Wicked, Vero’s & La Trattoria. These were the results of our Cabo Pizza Mission. The owner of Wicked, nicknamed “Boston” due to his birthplace, decided to choose the most wicked awesome location in town. 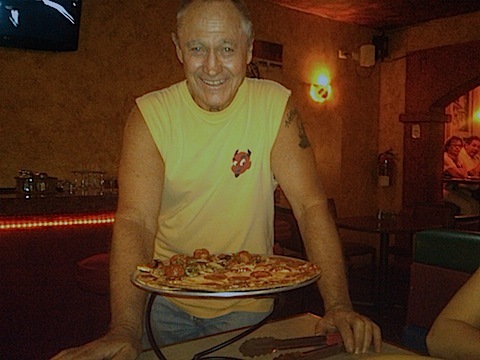 This pizza restaurant is only about a year old, with ample indoor seating and located right next to Squid Roe on the main party strip downtown. No need to settle for Dominos delivery as they deliver with in 10 miles outside of Cabo from 12 pm to 12 am. Slices are sold until 4 am making sure any late night cravings are satisfied and slices are an affordable 45 pesos or so each. His best selling night was 487 slices from 1-3 during Spring Break 2010. So surprisingly (or not surprisingly) the main beverage he sells is water although it is a full service bar. It’s the perfect late night place to kill your hang over before it happens. Located on the street right before Squid Roe and across from It’s Amore, this spot is dedicated to New York style pizza. With big slices and soft dough you dig in and immediately think New York. Cara was in awe of how much it reminded her of NYC – right down to the New York City style ovens. 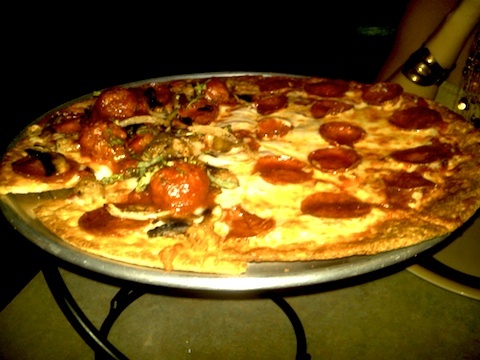 Depending on the night, they have incredible specials like 3 Grande pizzas for $20. Although they have a small seating area this is more of an on-the-go spot and they deliver as well. No alcohol served. Located directly across from Squid Roe, this is also a great jumping off location. 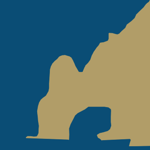 La Trattoria has been open for many years but for the past 6 years is has been owned by Juan Castañeda. This restaurant offers many ambiances so you’re sure to find one that could fit your mood. The inside is quaint and homey with the feel of a little Italian country house. The outside front patio has a few tables but mostly focuses around the bar and 3 flat screens surrounding it. This can be a great area for any games or important events in the States. The prices are medium and the menu is extensive. 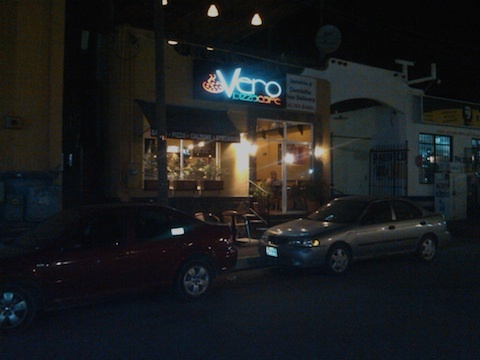 They offer all types of Italian food and the pizza is cooked in a wood-burning oven for that authentic taste. While all the pizza was delicious and it was very difficult making a decision, I thought Vero’s was the best over all pizza. It just hit the spot. I understand everybody does not have the same tastes so you have to try them all and see yourself if you’re up to the task. The best ambiance was definitely La Trattoria. The decor really gives an authentic Italian feel and the large outdoor bar is just so inviting. 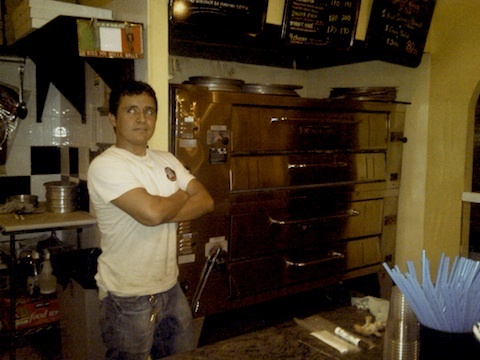 The owner, Juan has a really interesting story and is the definition of someone that followed and fulfilled his dream. Always friendly he will make you feel welcome. This is a must try for any occasion – romantic, casual, fancy or even the latest sports game. And Wicked wins for the most personality. Boston was fabulous to chat with. After the visit, Cara and I kept calling everything “wicked awesome.” Fantastic branding! Hope this helps you find the best slice of Cabo. We were STUFFED by the time our mission was over. 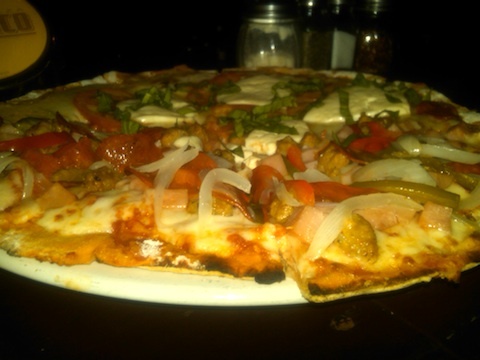 Do you have a favorite pizza in Cabo?